UPDATE: SOLD IN 3 DAYS! 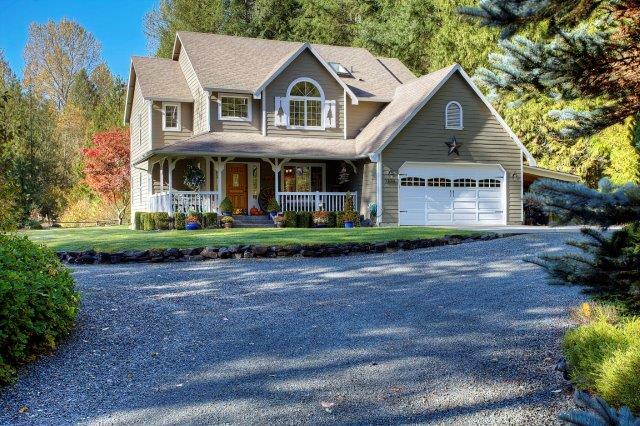 Charming Custom 4 Bedroom Home on Serene 5+ Acres in Eatonville! 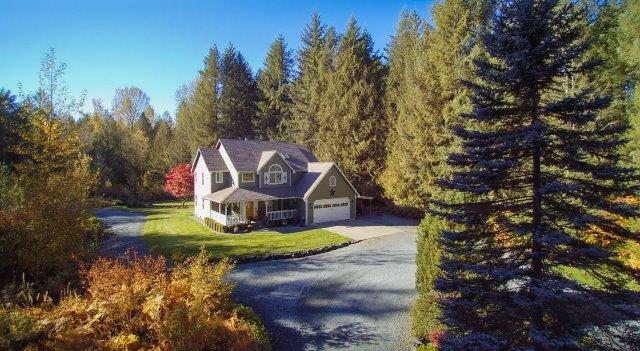 Welcome to Eatonville, where peace and tranquility await in this secluded 2 story home nestled on 5 level acres! Come on up the covered front porch and step inside your own private paradise! 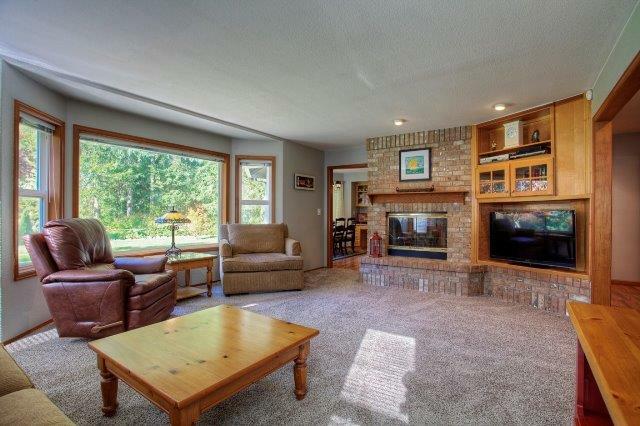 Continuing in to the cozy living room you can imagine spending relaxing moments staying warm by the brick fireplace and watching your favorite shows by the built in entertainment center. 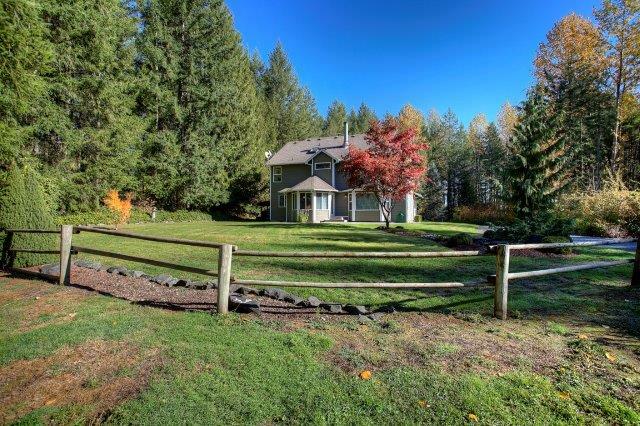 Notice the large wood wrapped windows too, so you can enjoy the peaceful outdoor views of your private sanctuary. Continue into the kitchen and breakfast dining nook and take note of the large windows where you’ll enjoy the view while having a light meal with the pleasure of your friends and family’s company. 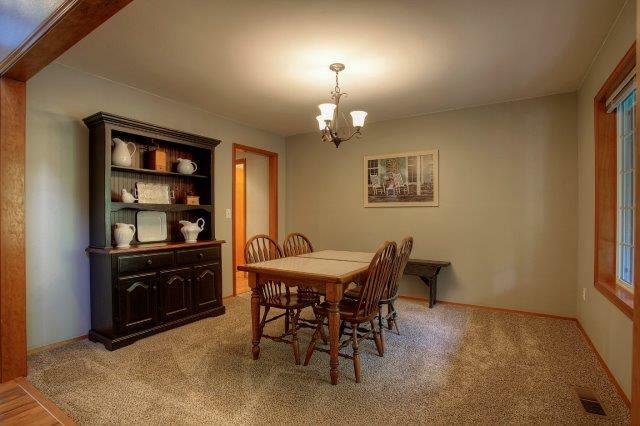 Note the built in desk to the right and display cabinets above. The kitchen is the hub of this home, so it was designed with gathering in mind! 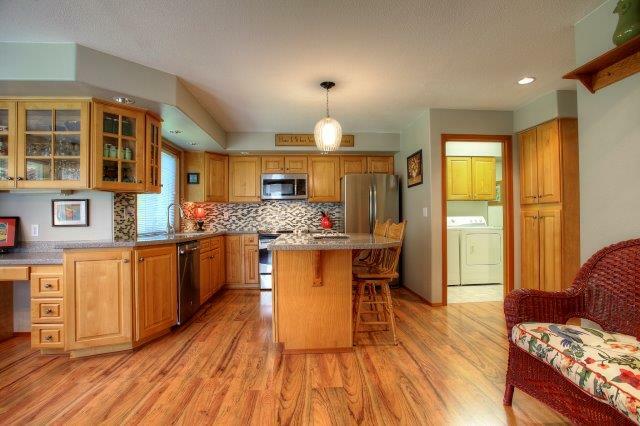 Enjoy Corian counters, a full height tile back splash, custom solid wood cabinetry and all stainless appliances. Don’t worry about storage space, there is a pantry, too! 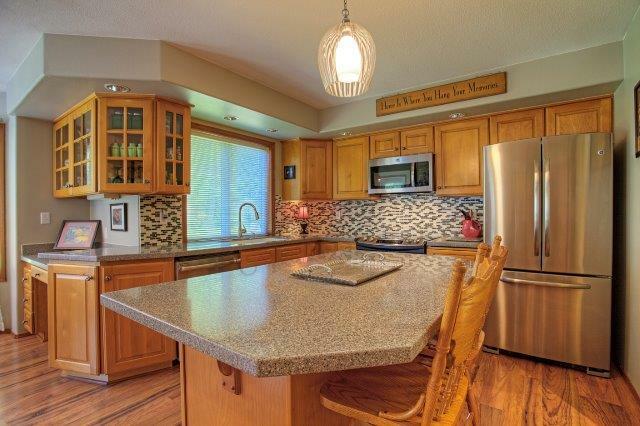 The center island is perfect to sit and watch the chef prepare meals for a hungry tribe…. now, who is signing up to help chef with dishes after enjoying a home made masterpiece? What a thoughtful touch…. 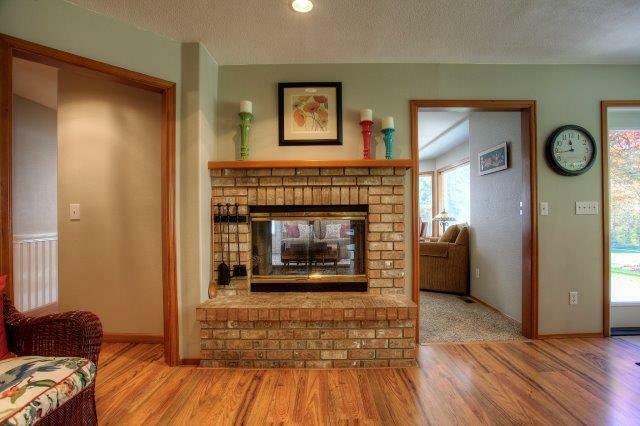 the fireplace is enjoyed in the kitchen area, too! This house just breathes COZY! 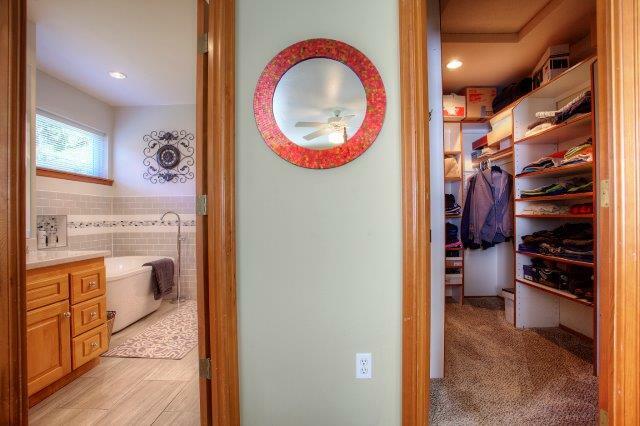 Look at this awesome generous sized walk-in closet with tons of built in shelving! 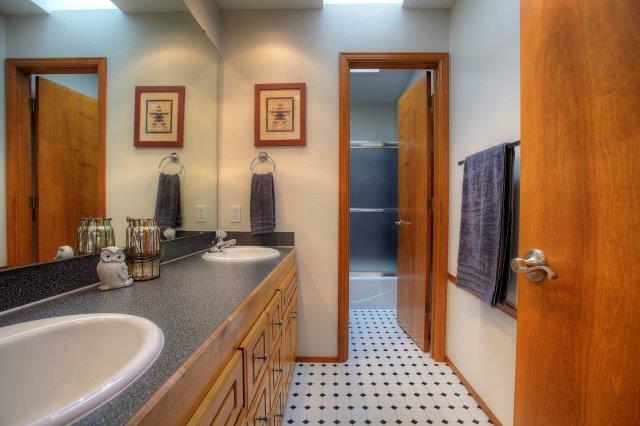 The Master Bath has been remodeled and features all the luxury you need! Note the double vanity with Corian countertop and tile flooring that blends just beautifully with the decorative tile surrounding the modern freestanding garden tub. Through this door is the shower designed with a custom made door and toilet for complete privacy. Your day at the spa is right in your own home…. 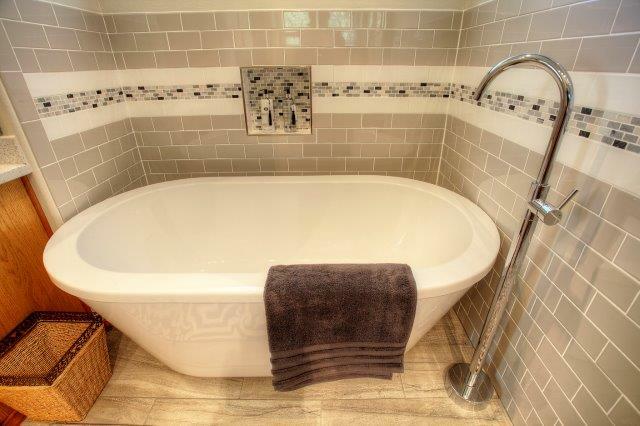 imagine soaking your troubles away in this beautiful and modern free standing tub! 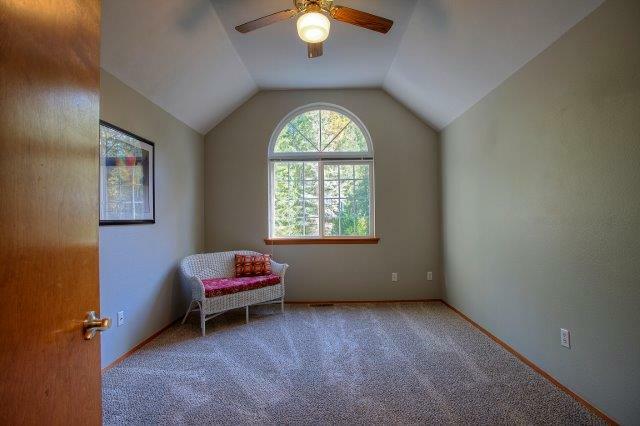 Upstairs you’ll also find one of three additional bedrooms that features an arched window. Arch shaped windows bring a softness to a room and juxtapose the straight corners of rectangular windows and walls for a contrasting effect. It is perfectly appointed in this room, don’t you think? 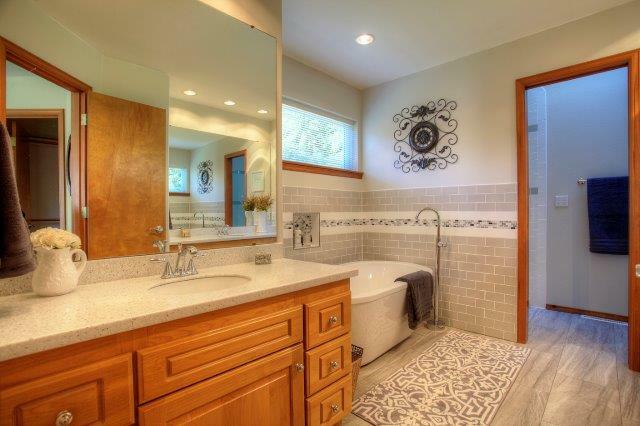 You will also enjoy another full bath complete with a double vanity sink and tub/shower enclosure. A skylight above allows soft, ample lighting year round. 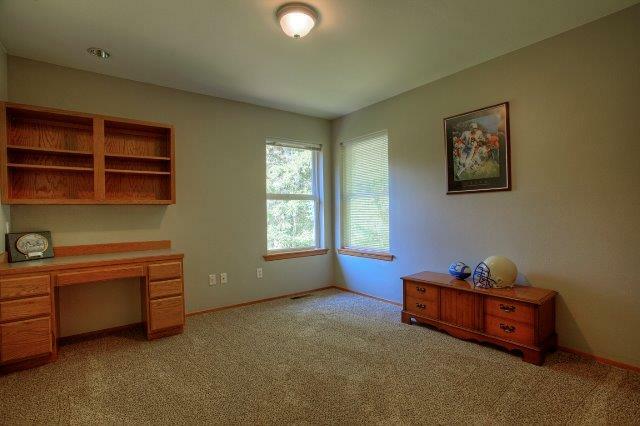 Another bedroom features a built in desk with storage cabinet, just perfect for your student! 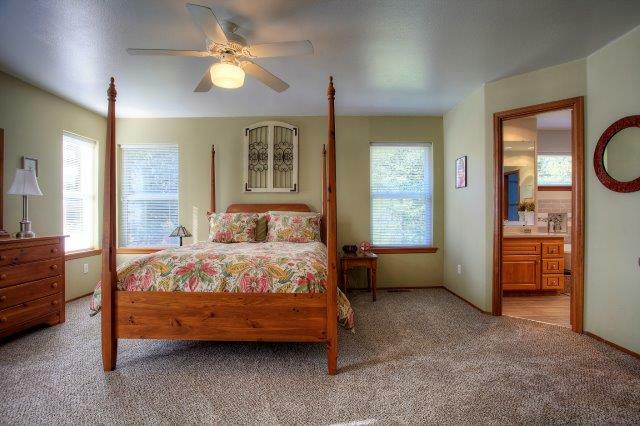 Did I mention there is all new carpeting throughout this home, too? 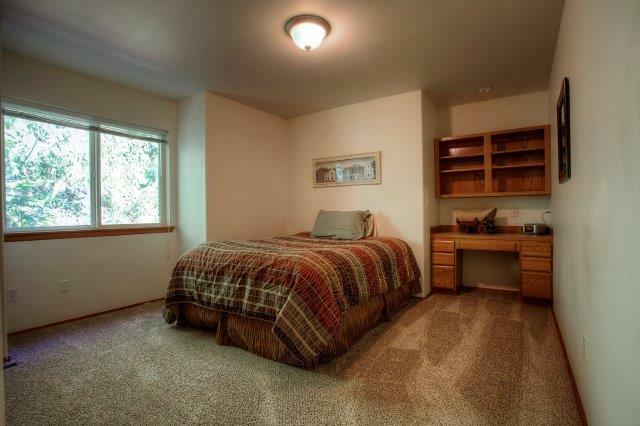 The 4th bedroom also comes complete with a built in desk and storage cabinet. It is perfect for your guest or other student! The view of the back of the home showcases all of the privacy and plethora of space you’ll ever need. 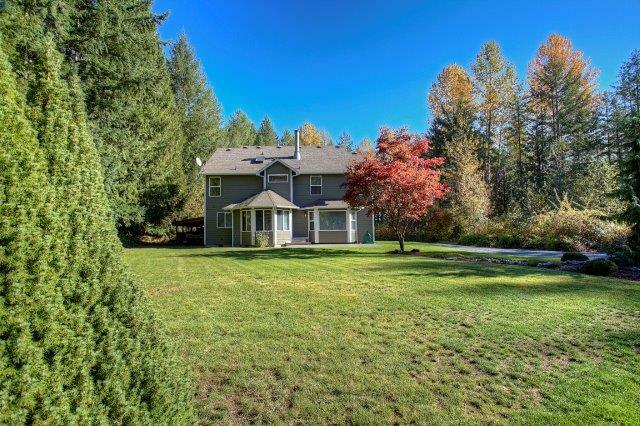 Fire up the barbecue, break out the toys and enjoy quality family and friends time on this level and beautifully landscaped lot. 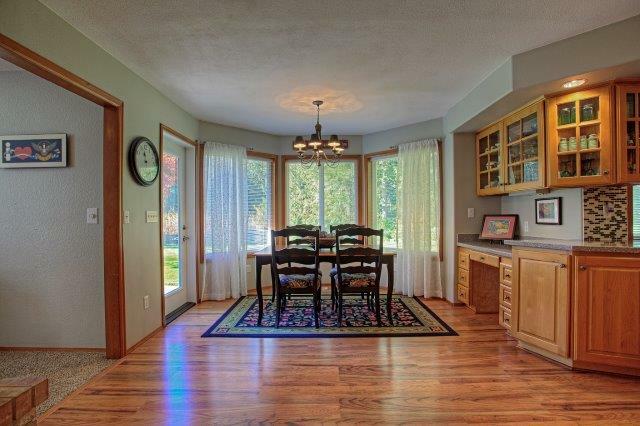 The words “I’m bored” will NEVER be uttered here at this home, let imaginations run wild! Another view of the grounds. Only a small portion is carved out for the home-site and yard. With 5+ acres there’s loads of opportunity to build out a barn, outbuildings or shop. What are your plans for this incredible property? It’s like something out of a magazine and it can all be yours today! 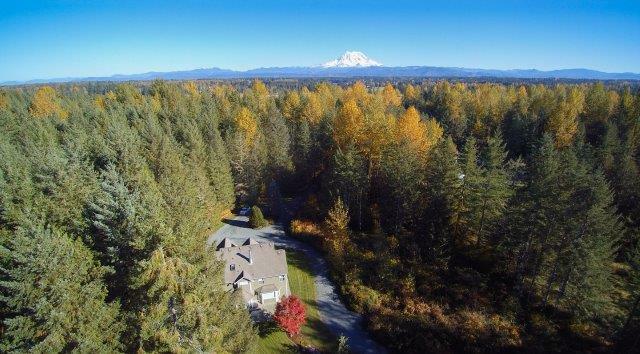 The City of Eatonville, located on the south end of Pierce County WA is an outdoor enthusiast’s wonderland and is just a short distance to JBLM, Tacoma and is in short proximity to the majestic Mount Rainier National Park. If you love the great outdoors, you’ll be in heaven here! Year round activities include hiking, fishing, camping, horseback riding, mountain biking, skiing, snowboarding, wildlife viewing and so much more! When nature calls, make sure to experience the premier wildlife and adventure park, Northwest Trek, where you’re sure to see moose, bison, elk and much more as you explore 435 acres of natural habitat (they have a zip line, too if you’re really adventurous!). Eatonville is the perfect place to get away from it all, yet still be close to the bustle of the city. Don’t miss out on claiming your own slice of heaven!